Included on DVD with MARX RELOADED! How many people have actually read the work of Karl Marx? Based on the book by the Mexican cartoonist Rius, MARX FOR BEGINNERS is a hilarious animated film that highlights Marx's most influential ideas, and places them into the context of western civilization by introducing Pythagoras, Plato, Aristotle, da Vinci, Copernicus, Galileo, and Descartes. All in seven minutes! 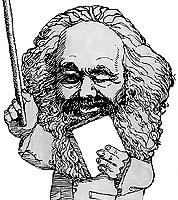 High school and college audiences will find the film an amusing introduction and discussion starter on Marx's work, while non-academic audiences of all ages will be entertained by the lively and irreverent treatment of one of the world's most important thinkers. Blue Ribbon Winner, 1983 American Film FestivalQuestions or issues with the Marx for Beginners iPhone app? Contact app support at Icarus Films.